In your search for the perfect gift for someone, considering their passions and activities they find enjoyment in is a fantastic way to find the perfect gift. In this case, if your friend is an avid writer, instead of buying them just a book by their favor it author that will be read once and stored on a bookshelf, consider creating a small gift basket with nick-knacks that a devoted writer will be sure to love. Here is a quick guide to making your very own gift set for a friend who loves to write, providing you a thoughtful and unique gift. 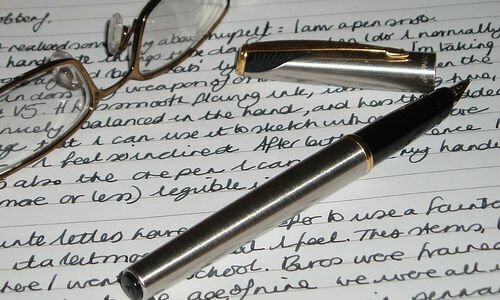 Fountain pen – Comfortable and fun to use, the fountain pen is a lost writing utensil that many have never had the pleasure to use. These pens let you write with little pressure and encourage flowery and unique handwriting. are perfect additions for any pen collection. Stationary – High quality paper makes a huge difference in a writer’s experience, so go the extra mile a pick-up some quality stationary to make their writing sessions that much better. Bookstore gift card – Almost every writer is also an avid reader, so instead of picking out a book for them, give them the opportunity to head to their favorite bookstore to browse and buy what they love. , is perfect for storing pens and pencils for a writer, keeping them in a neat and organized place.